This may seem yet another of my tenuous links – after all, the house was demolished nearly 90 years ago. 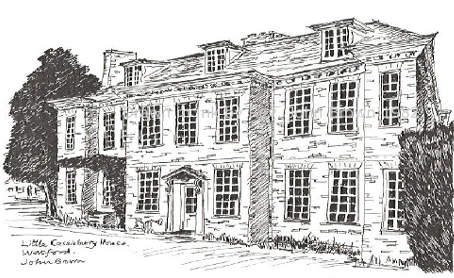 However minor details like that have not prevented me from writing about other long gone houses, such as Carlton House, which was pulled down in 1825, or the ruined Barnbarroch, in Wigtownshire or Edwinsford, in Carmarthenshire. In this case I am posting an essay on Cassiobury because I have recently been asked to work on a house that was apparently built with elements from that ancient building. This later house is in Upstate New York and is the subject of a later post. In 1546, Henry VIII made Sir Richard Morrison Lord of the Manor of Cassiobury and Sir Richard began building Cassiobury House in the same year. The area that he was granted extended from near Moor Park in the South to almost North Watford. Very little of the house had been completed by the time of his death in 1556 and it was up to his son, Sir Charles Morrison, to complete the work. When finished, the mansion had 56 rooms, a brewing house, stables and a dairy. In 1627, Sir Charles’ daughter, Elizabeth, married Arthur Capel and the estate passed to the Capel family. In 1649, Lord Capel was beheaded by the Parliamentarians for his loyalty to Charles I. Detail from ‘Cashiobury in Hertfordshire’. Engraving by Johannes Kip after Leonard Knyff. From James Beeverell’s Les délices de la Grande Bretagne, ca.1707. Arthur’s son, also named Arthur, was made the Earl of Essex at The Restoration, by Charles II and the estate was passed back to the family. 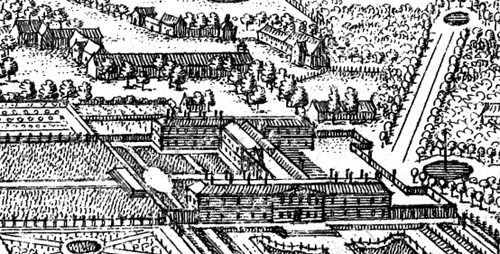 Arthur Capel had the Tudor house rebuilt, between ca.1674-80, with an ‘H’ ground plan by the architect Hugh May – described in Samuel Pepys’ Diary as ‘a very ingenious man’ – to create a new house, incorporating the old. The layout of Cassiobury owed less to internal convenience and more to external show which resulted in a more spread-out plan in contrast to May’s other work at Eltham Lodge or Moor Park which were ‘triple-’ and ‘double-pile’ respectively. Work was slow with May regularly requesting money from the Earl, who was then in Ireland in his role as Lord Lieutenant. May kept the one wing of the Morrison house but added a central wing with pediment to which he then added a second wing to create an ‘H’. Retaining part of the old house was regarded as a mistake, even by contemporaries, as it created an awkward plan which was never completely resolved. 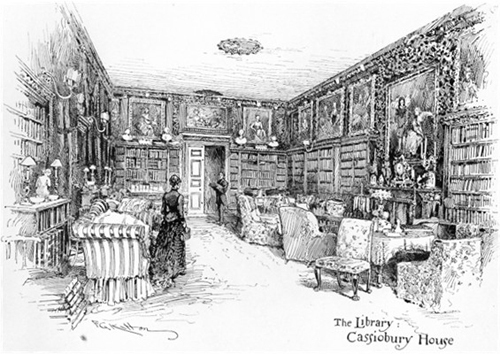 It was really in the interiors where Hugh May excelled at Cassiobury – with the help of one of the finest sculptors and wood-carvers ever to work in England, the Dutch-English Grinling Gibbons. On 18th April 1680, John Evelyn accompanied Gibbons there. 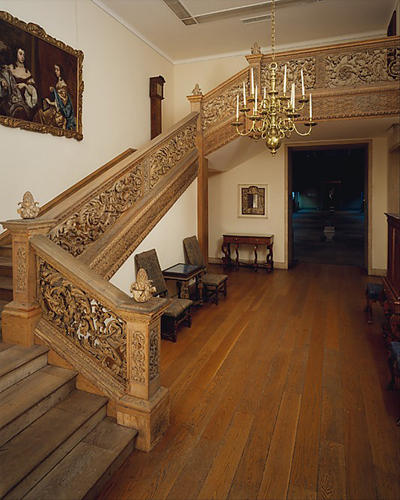 Cassiobury was Gibbons’ first large scale work and the highlight was the superb staircase; adorned with pine-cone finials, and featuring various natural forms including acanthus and the symbols of the Royalists – oak leaves and acorns. The panels may well be his handiwork as it is doubtful that, at this early date in his career, he would have had an assistant capable of such work. If it was by Gibbon’s hand it is the only known example of one of his staircases in spite of the recent attribution to Edmund Pearce by the New York Metropolitan Museum of Art. 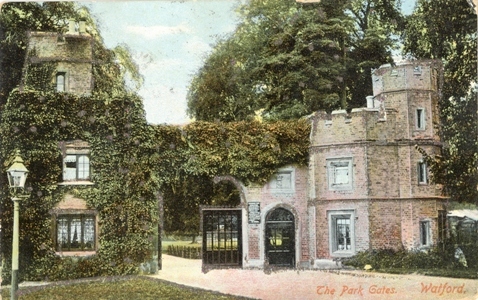 The Earl is also believed to have been the person who commissioned the building of Little Cassiobury (the dower house which still exists in Hempstead Road, Watford). It has recently been confirmed that this house was designed by Lady Elizabeth Wilbraham (posited to have been the first woman architect). More about this very interesting house can be seen on The Friends of Little Cassiobury House website. In 1683 Arthur Capel, 1st Earl of Essex, was implicated in the Rye House Plot, accused of plotting to assassinate Charles II. Like his father before him, Arthur was imprisoned in the Tower of London. In July 1687 he was found dead at the Tower, his throat cut, apparently by his own hand. As this occurred before his trial for treason the Earldom continued, and his heirs were allowed to inherit his property and titles. It is known that André Le Nôtre, the French architect and ornamental gardener to Louis XIV, was engaged on planting trees on the estate for the 1st Earl. Arthur’s son, Algernon, the 2nd Earl continued work on the grounds, employing Moses Cook to devise many woodland walks and avenues. George London and the royal gardener Charles Bridgeman also worked at Cassiobury. However, although perhaps unremarkable from the outside, the interior was well adorned in May’s typical ‘mature, baroque style’. The 5th Earl of Essex, George Capel-Coningsby, arrived at Cassiobury in 1799 and commissioned James Wyatt to remodel the house. Wyatt was widely criticised by contemporary and later antiquarians for his destructive remodeling of cathedrals which involved removing anything later than a certain date. 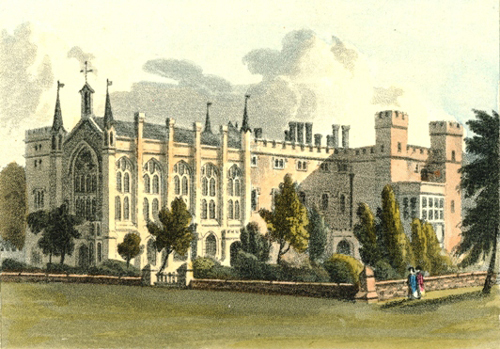 However, he was also admired by many for his confident handling of Gothic details which reached its zenith in his work for William Beckford and the vast Fonthill Abbey. The work was probably completed by 1804 when it is recorded that the Prime Minister, William Pitt the Younger, had visited Lord Essex there. Around the same time, Humphry Repton was employed to landscape the park, introducing his distinctive style and features such as the lake and canal. Although with Wyatt’s reputation it might have seemed likely that he would have kept little, Wyatt actually only removed two front wings and then enclosed the courtyard. 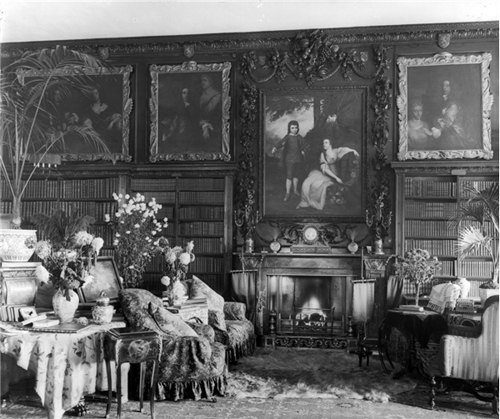 Inside, he retained Gibbon’s woodcarvings and ten of May’s reception rooms, although the names and uses of these rooms were changed. In spite of this work the exterior was regarded as unsuccessful – an unsatisfying neo-Gothic compromised by the proportions of the existing building. The house was reoriented at this time and the four staircases of the house were altered. The principal staircase of the old house was put in a position adjoining the Great Cloister, where a subsidiary staircase was also placed. “On Wednesday we went to Cashiobury, the seat of the Earl of Essex, which is a very pretty house and more full of comforts, curiosities and pretty things than any other house I ever saw. Lord and Lady Holland, Lord Auckland and several more now in the house”. “Lady Essex took us all over her flower gardens, which I declare are the most complete in England”. By 1895, most of the work was completed. Wyatt’s nephew, Sir Jeffry Wyattville designed various buildings and lodges for the grounds. Only one now survives: Cassiobury Lodge, in Gade Avenue. From Hertfordshire County Homes. 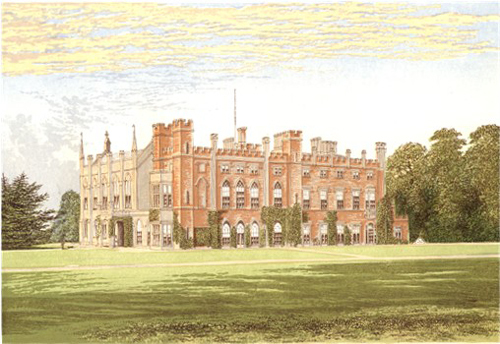 Descriptive Accounts of the Principal Family Mansions in Hertfordshire. Anonymous. 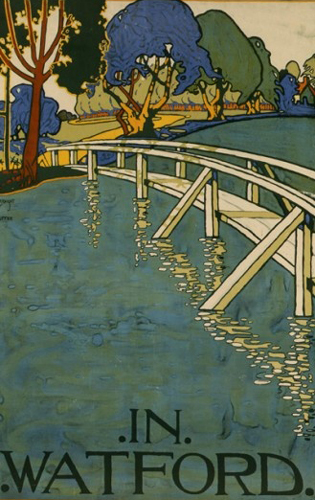 Illustrated by F. G. Kitton. 1892. Many dignitaries visited the house and parties were held almost on a weekly basis. The most notable visitors being Winston Churchill and Edward VII, in 1902. The upkeep costs to the house and grounds began to rise dramatically and the family decided to let the house and move back to London. In 1909, 184 acres were sold to Watford Borough Council, by George Devereux de Vere Capell, the 7th Earl of Essex, for housing and the public park. It was this relentless urban growth which eventually was to overrun the gate lodges. The 7th Earl died in 1916 after being hit by a taxi, and just six years later the estate was put up for sale by his widow and his son, the 8th Earl. …was auctioned by Humbert & Flint, in conjunction with Knight, Frank & Rutley. The sale of the contents lasted ten days and consisted of 2,606 lots. 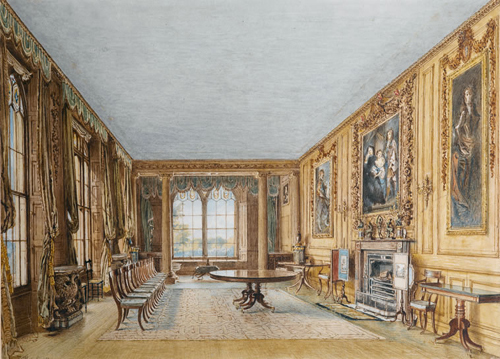 The Capels had long been collectors of art, with their galleries containing works by Turner, Lely, Landseer, Wilkie, and much furniture, particularly French. The sale also included four separate libraries. Some items from Cassiobury, published in the catalogue or sold separately, have reappeared in public and private collections. Six English stained-glass windows from the Great Cloister are in the Victoria and Albert Museum, London. A bureau plat from the Inner Library, by the French maker who signed B.V.R.B., is in the Elisabeth Severance Prentiss collection at the Cleveland Museum. 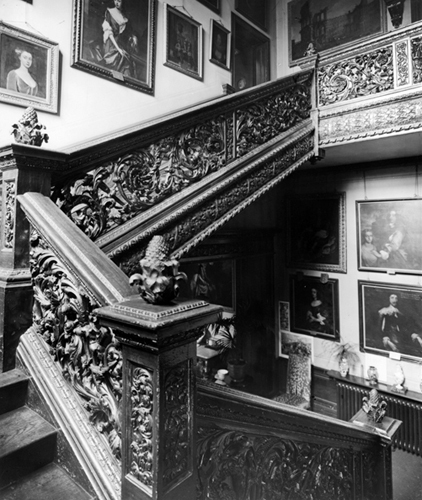 Some of Grinling Gibbons’ carvings for the rooms were acquired for the Hearst and Wernher collections. “To lovers of the antique, architects, builders, etc., 300 tons of old oak: 100 very fine old oak beams and 10,000 Tudor period bricks”. It is thought that the house called Cassiobury, in Bedford Hills, New York, is supposed to have been built with many of the bricks and may also contain other elements of the original house. I am currently working on this house and researching its construction and contents. The Hertfordshire house itself was also offered but didn’t sell until August 1922 when a group of local businessmen bought it for the development potential. It was finally demolished in 1927 with Watford’s suburbs expanding until today the site of the house is a residential estate with no sign of its former glory or grand associations. 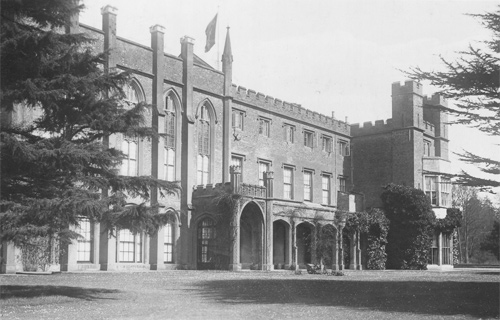 In 1967, the historic Cassiobury Gates were demolished to make way for the widening of Rickmansworth Road. London was expanding and large areas of open land were built over in the early twentieth century. 4) The Earl’s ‘Girl’! Miss Adele Grant, Flits From One English Lord To Another!The Esoteric Curiosa. 2 John Evelyn. The Diary of John Evelyn. Volume II (of 2), Edited by William Bray. 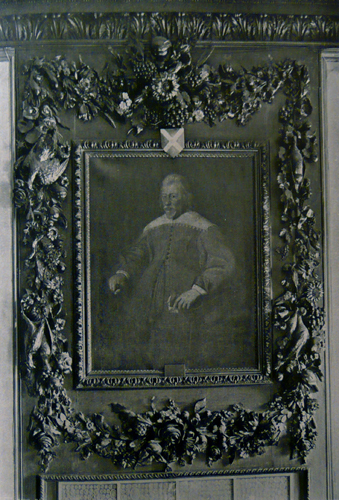 3 Giovanni Bagutti (1681 – after 1730) Plasterer. He worked with Giuseppe Artari at Cannons, Middlesex; Octagon House, Twickenham; St Martin-in-the-Fields and various other buildings. 4 John Gould. Horace Walpole, George Vertue. A Dictionary of painters, sculptors, architects, and engravers: containing biographical sketches of the most celebrated artists, from the earliest ages to the present time, to which is added an appendix, comprising the substance of Walpole’s Anecdotes of painting in England, from Vertue, forming a complete English school. 1810. 5 John Cornforth. Early Georgian Interiors. Yale. 2004. 48. 6 Robert Sanders. The Complete English Traveller: or, A new survey and description of England and Wales, containing a full account of whatever is curious and entertaining in the several counties of England and Wales, the isles of Man, Jersey, Guernsey, and other islands adjoining to, and dependant on the crown of Great Britain. 1771. 7 See John Britton The beauties of England and Wales: or, Delineations, topographical, historical, and descriptive, of each county. Volume 7, Part 1. 1808. 8 Country Life Sept. 17th 1910, 399-400. I was Curator of Watford Museum for a while in the late 90s and groaned every time an older person told me that “you lot” tore down the Cassiobury gates! People fondly remembered a man with a monkey you could hold for photographs. Sadly there was no way of moving them intact even if that had been the plan in the 1960s. They were dilapidated. Watford Museum still has a nice Cassiobury collection including a small Turner and a hankie dipped in the blood of the executed Earl! No. I understand about the gates. Few things are straightforward. I have been to the Museum, but that was in connection with helping to rescue the stolen doorcase from Frogmore House – http://patrickbaty.co.uk/?p=8909 I must re-visit and see what they have on Cassiobury. I am trying to identify elements in an American house that are alleged to have come from the Hertfordshire House. Thanks for getting in touch. Goodness! How extraordinary. I’m sure that my American client will be as fascinated by this connection as I am. 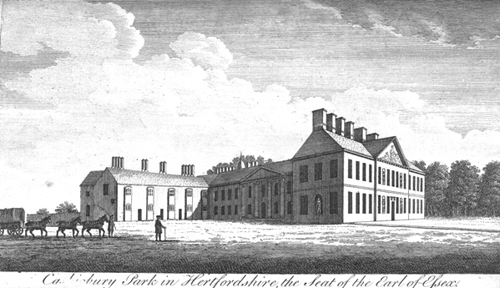 My 3x gr grandfather was steward to the Earls of Essex in the 18thC, George I’s time, (1720′s). He is reputed to have come from Germany to manage the estate. His son, Joseph Stocker (b. 1782) was coachman to them and the last census entry he is recorded in, was living in The Lodge. I would like to know where the name came from for Stockers Lake. although it was created in the 1920′s, is this a connection with my Stockers? one of these Stockers was important enough to have his portrait painted – I have this.